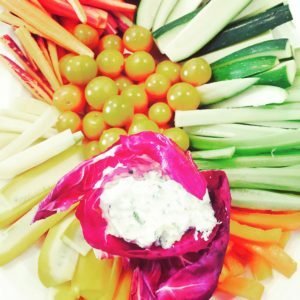 We all love a fresh crudité. It is always a hit, even in its simplest carrot-broccoli-cherry tomato form. It’s one of those rare things that work for kids and grownups, Paleo and gluten free eaters, vegetarians, Beyonce dieters and anyone else you can think of. A show stopping, veggie centerpiece is a rare gem, but worth aspiring for. Whether hosting or showing up to the party with a contribution, here’s the way to create a to die for platter that everyone will rave about. A well planned pile of fresh parmesan chunks or Kitchen Table Baker Parmesan Crisps add dimension to your platter and enhance the textures and flavors you’re offering. You can do the same thing with any flavorful hard cheese, tapenade, a pile of olives or even some crispy crackers, such as Mary’s Gone Crackers. Send me a picture of your amazing hors de oeuvres crudité platter. With your permission, I’d love to showcase it.